Wow, so the first day of Comic Con is over. 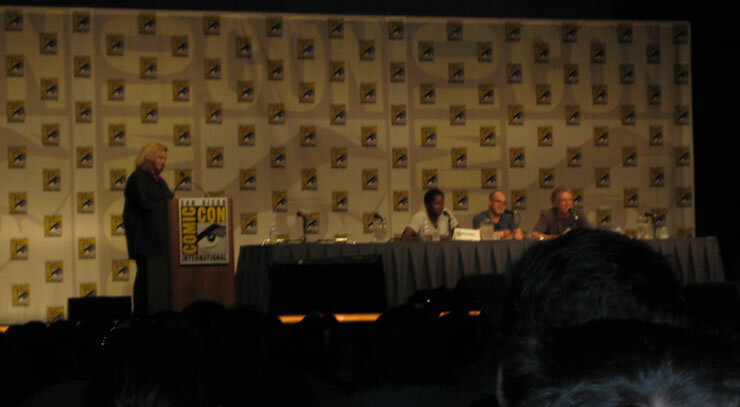 I attended the LOST Panel and wished we had gotten more scoop about Season four. I didn’t feel like they gave us that much insight into what we can expect from Season Four, especially with the news about Michael (Harold Perrineau) coming back already announced yesterday at the TCA, there wasn’t much left. I think another part of it is the fact that Lost won’t be returning until February 2008. This means they haven’t started shooting yet, although they have started writing, so there isn’t much to say as of yet. 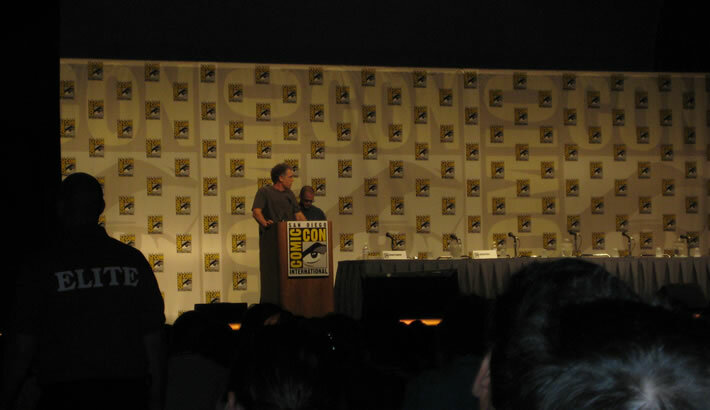 Damon Lindelof and Carlton Cuse come on stage. They show us a clip of the Lost video game. I heard someone behind me say that they will buy it just to watch all the “sequences” (and this is why marketing works…but then again I guess I’m not better, I’m a sucker for those things). Lindelof and Cuse have brought little bells that they each will ring if the other one gets carried away and is starting to spill too much. Funny little device. Someone asks about the violence in the show and Lindelof makes a point that in season one “our guys” committed more acts of violence than the others committed in Season 3. The only difference is “our guys are just lot prettier. When Sawyer is like punching you in the face, you’re kinda like, “more, please”.” Good point, good point. More Flash Forwards in Season Four. We will still have flashbacks as well. Damon Lindelof says that the question is: “How forward, how far we’re going to go, and with whom…(to Carlton Cuse) I see you reaching (the bell) “You’re gonna be pleasantly surprised.” I certainly hope so. Question about whether Claire and Jack will find out they are brothers and sister, Damon Lindelof “I would say…” bell rings (by Carlton Cuse). Lindelof nods his head several times, YES! Interesting fact about Ben, he got caught in the trap by accident. We will find out why Ben was heading across the island when he got caught. That’s pretty cool. A “fan” request to hear more about Michael’s (Harold Perrineau) return. I put fan in quotation marks because obviously she was part of the panel, because just as she makes her big speech, Harold Perrineau comes on stage!!! Nicely done! And how fun to see Michael again. They also announced that Michael will be a series regular in the fourth season, so we will see a lot more of him. Someone asks about Nestor Carbonell (who plays Richard Alpert, the guy who doesn’t age). Since he will be on CBS’ Cane, they are not sure if he will be back. Finally, they showed us a video from the Dharma Initiative: The “scientist” we are so familiar with is getting his make up put on. Makes a remark about how it doesn’t matter if he shines. They start filming one of those orientation films we have learned to love, in which he talks about how the “Orchid Station is not a botanical research unit.” He is also holding a rabbit (cutest thing…) with the letters I S written on it. That pretty much concludes the Lost Panel.